For Check Point statement and FAQ, go the following page: www.checkpoint.com/kaspersky. 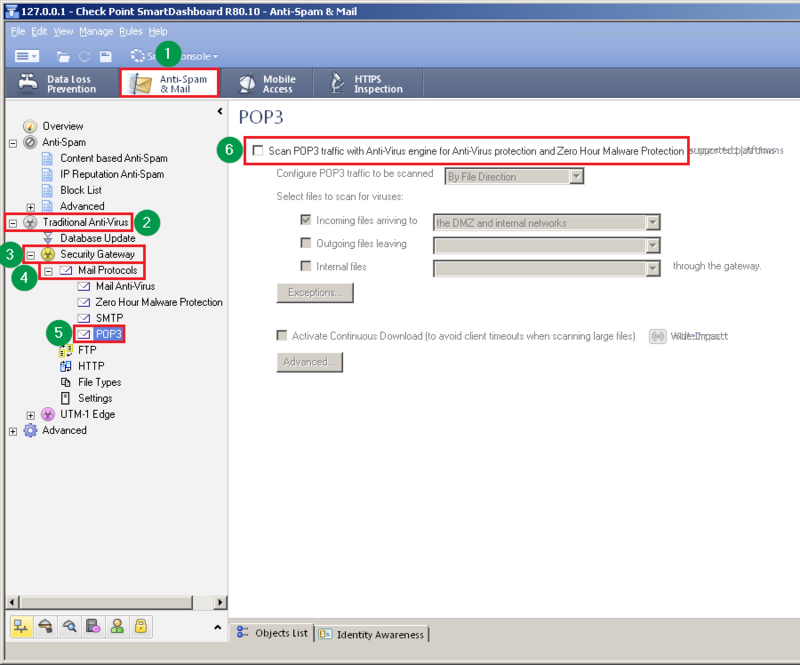 Check Point Security Gateway uses some 3rd party code in several features. One of the 3rd party vendors is Kaspersky Lab. 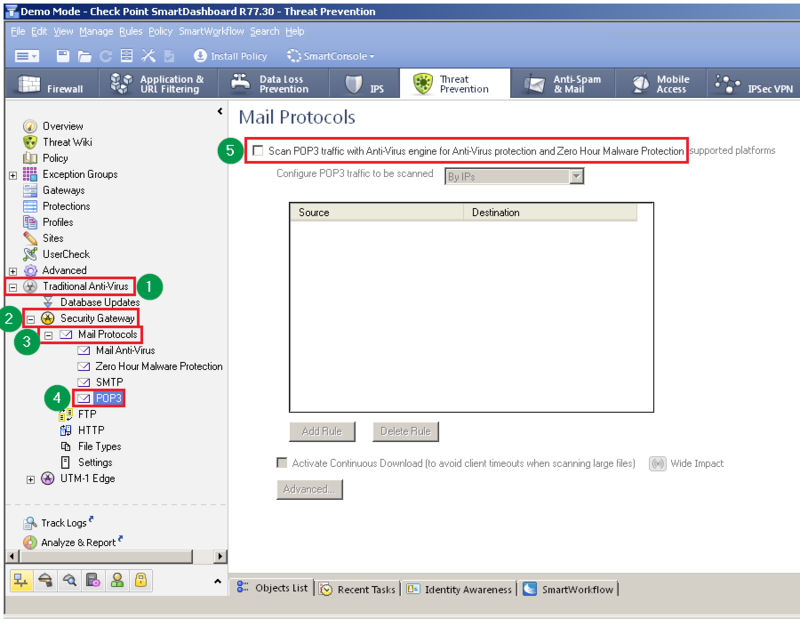 Customers who wish to remove Kaspersky Lab components from the Security Gateway can use one of several options. Kaspersky Labs Anti-Virus components were replaced in R80.10 image Take 462. Note: This image contains a suitable replacement for the Kaspersky Lab Anti-Virus components. This replacement might, in some cases, miss files that were otherwise caught by Kaspersky Lab code and in some cases, prevent malicious files that were otherwise missed. Make sure to install the latest Threat Emulation engine. Or follow sk92509 to install the Basic Package (released on 26 Sep 2017 (version 6.9 or later). 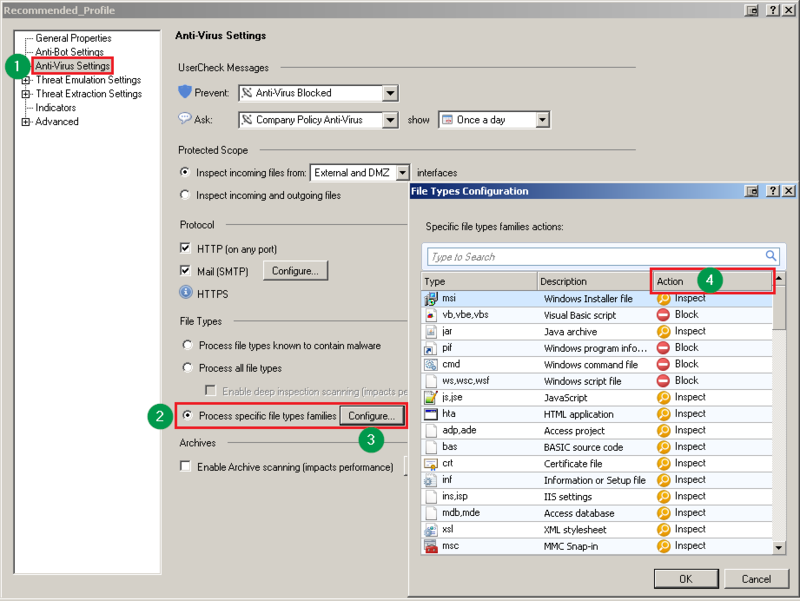 With Check Point R80.10 new image (Take 462), Endpoint Security Clients acquire their Anti-Malware signature updates directly from an external Check Point signature server or other external Anti-Malware signature resources, as allowed by your organization's Endpoint Anti-Malware policy. If your organization wants to continue using the Kaspersky Lab signature updates from the Endpoint Management Server, contact Check Point Support for a Hotfix. 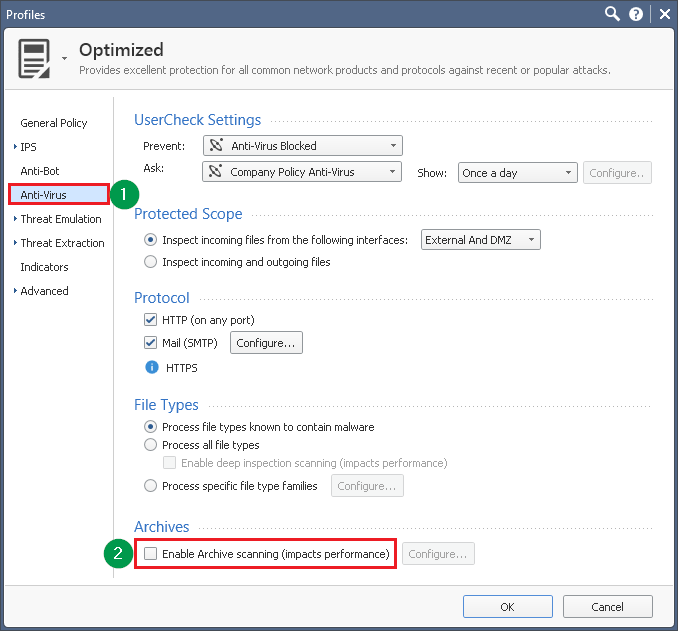 If Anti-Virus Deep Scan, Anti-Virus Archive Scanning, or Traditional Anti-Virus are enabled on your Security Gateway, then disable those features according to the summary table in section 6. Remove the 3rd party components by installing a relevant CPUSE package. Important Note: This procedure does not require a reboot or restart of Check Point services. This CPUSE package should be installed on all Gaia OS machines in your environment - Security Gateway / VSX Gateway / StandAlone / Management Server / Endpoint Security Management Server. You can use the sk111158 - Central Deployment Tool (CDT) to automate the deployment of this CPUSE package to the managed Security Gateways running on Gaia OS. CPUSE Software Updates Policy should be configured to allow self-update of CPUSE Agent. Otherwise, users should manually install the latest build of CPUSE Agent from sk92449. Connect to the Gaia Portal on your Check Point machine and navigate to Upgrades (CPUSE) section - click on the Status and Actions. In the Hotfixes section, click on the Check Point <VERSION> Hotfix for sk118539 (Kaspersky Anti-Virus Removal) - click on the Install Update button on the toolbar. Install the latest build of the CPUSE Agent. In the upper right corner, click on the Import Package button. In the Import Package window, click on the Browse... - select the downloaded CPUSE package - click on the Import. 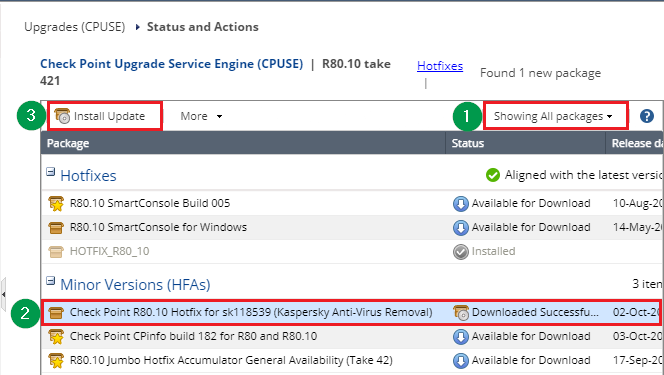 In the Minor Versions (HFAs) section, click on the Check Point <VERSION> Hotfix for sk118539 (Kaspersky Anti-Virus Removal) - click on the Install Update button on the toolbar. Connect to the command line on Gaia OS. Transfer the downloaded CPUSE package to the Gaia machine (into some directory, e.g., /some_path_to_jumbo/). 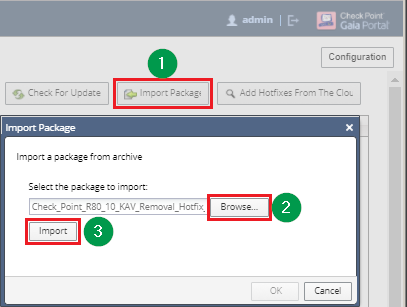 Note: When import completes, this package might be deleted from the original location. Note: In the top section "Hotfixes", refer to "<Package_File_Name>"
Re-enable Anti-Virus Deep Scan / Anti-Virus Archive scan / Threat Emulation Configuration. Prevention will now be based on a suitable replacement for the removed Kaspersky Lab components. Or follow sk92509 to install the Basic Package (released on 26 Sep 2017 (version 6.9) or later). Or follow sk92509 to install the Basic Package (released on 11 Sep 2017 or later). 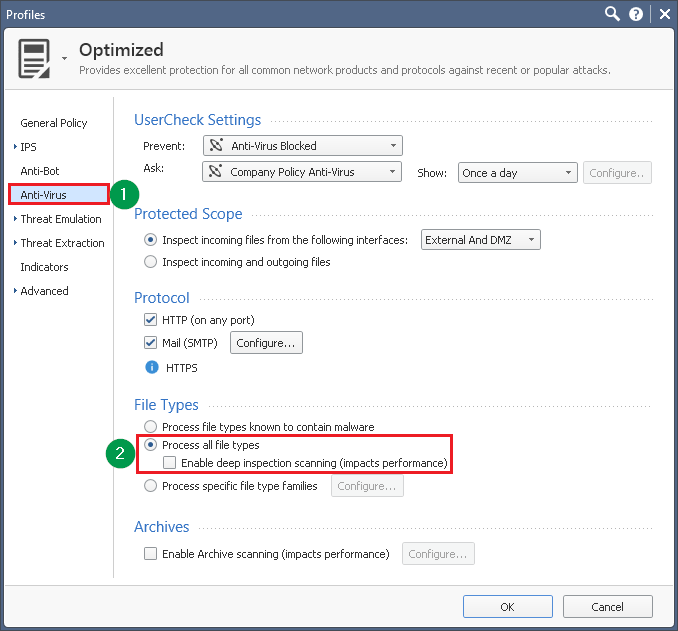 If Anti-Virus Deep Scan, Anti-Virus Archive Scanning, or Traditional Anti-Virus are enabled on your 60000 / 40000 Security System, then disable those features according to the summary table in section 6. Download this shell script to your computer (asg_remove_kav.tar). Transfer the shell script to the 60000 / 40000 Security System (into some directory, e.g., /some_path_to_script/). Connect to the command line on the 60000 / 40000 Security System. Appliances running Gaia Embedded OS do not contain any Kaspersky Labs code. No action is required. The Deep Inspection Scanning feature utilizes components from Kaspersky Labs. Note: Deep Scan feature is disabled by default (Anti-Virus will search for fewer virus signatures inside files). 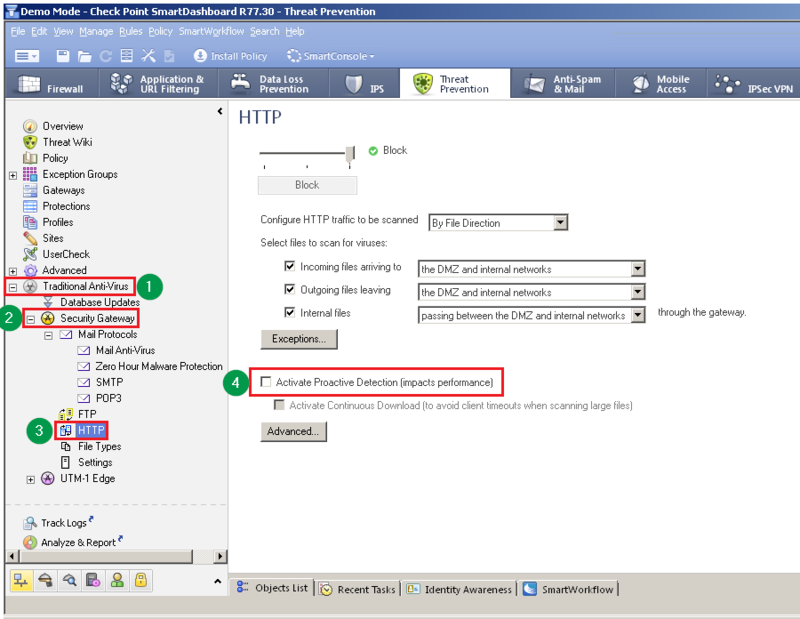 In SmartConsole Navigation Toolbar, click on the SECURITY POLICIES. In the upper left section, click on the Threat Prevention headline. In the bottom left section, click on the Profiles. 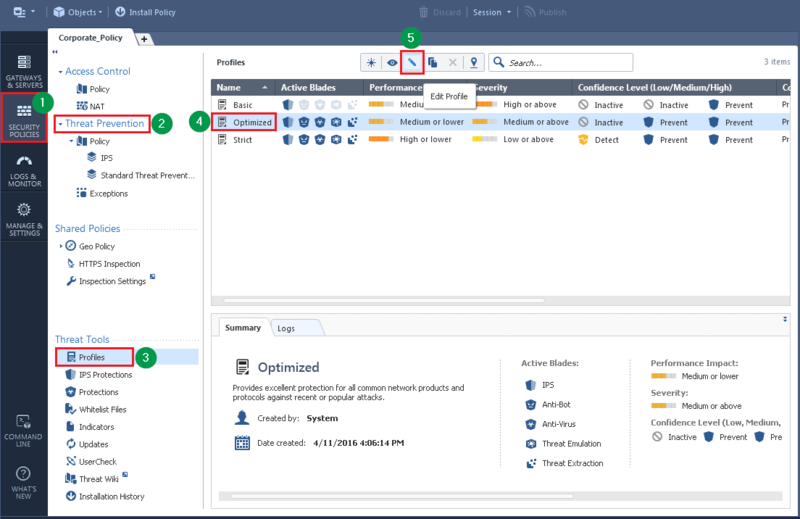 Edit the profile that is assigned to the relevant Security Gateway / Cluster. 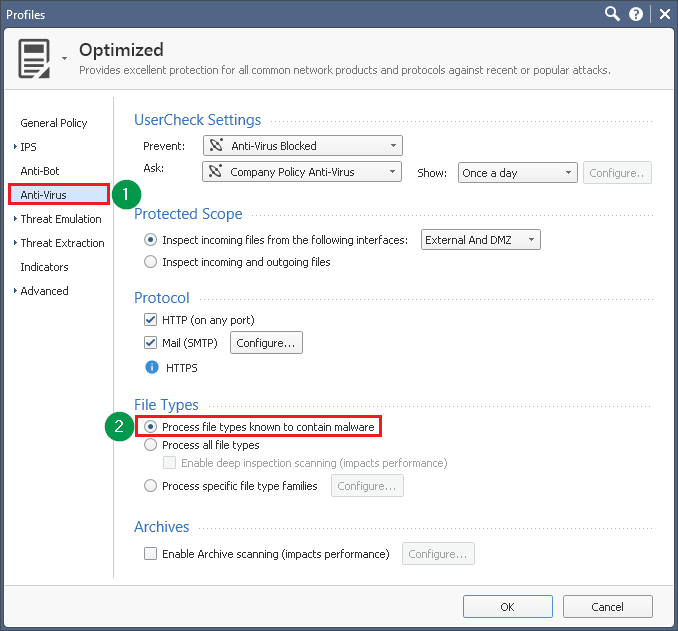 In the left tree, click on the Anti-Virus Settings. 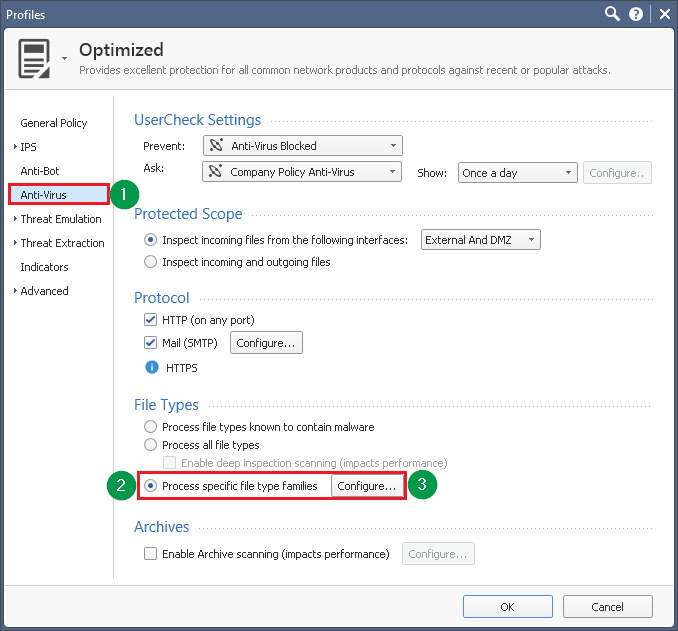 Select the "Process file types known to contain malware" option. 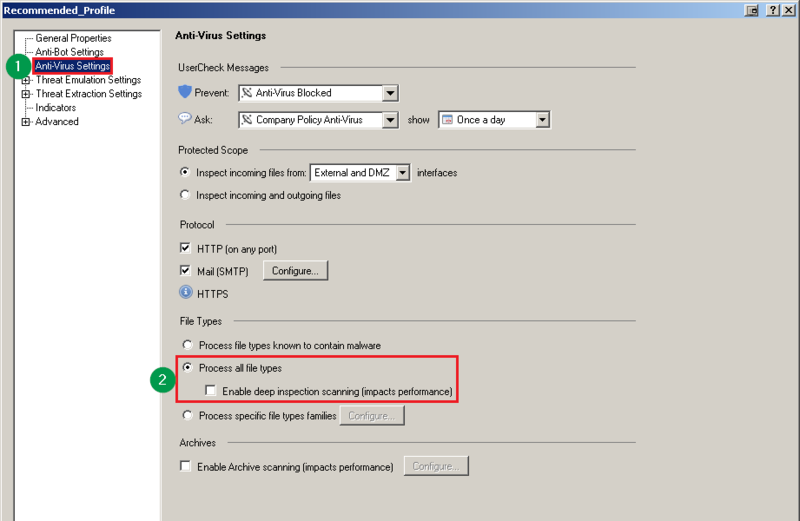 Select the "Process all file types" option and clear the box "Enable deep inspection scanning (impacts performance)". 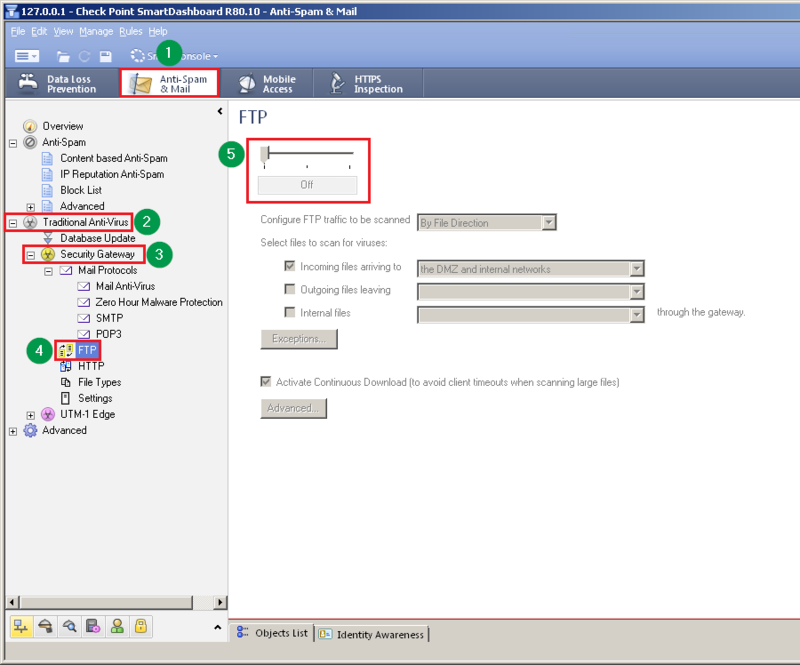 Select the "Process specific file type families" option. Click on the "Configure..." button. In the "Action" column, make sure that "Deep Scan" is not set for any of the file types. 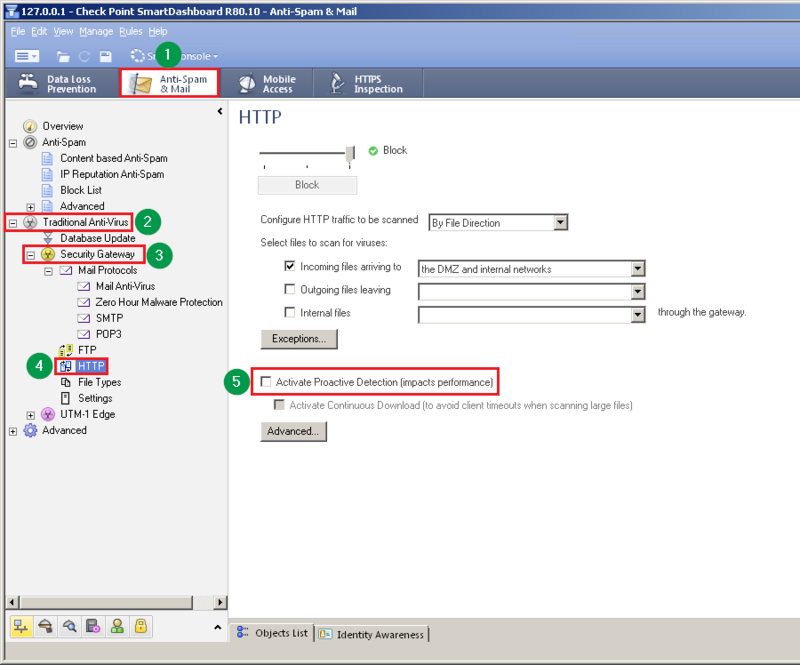 Install the Threat Prevention policy on this Security Gateway / Cluster. In SmartDashboard, go to the Threat Prevention tab. In the left tree, click on the Profiles. 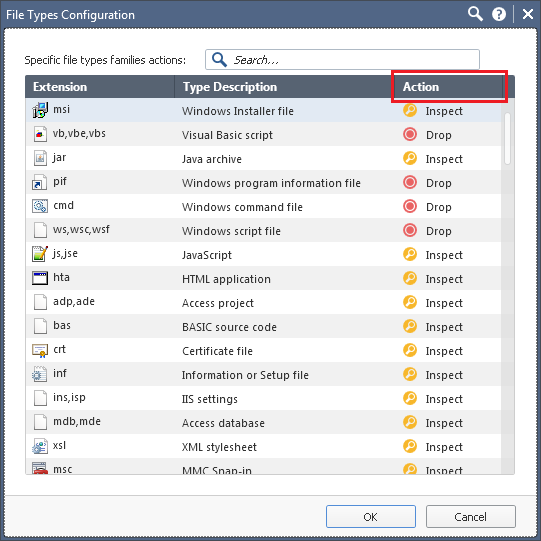 Select the "Process specific file type families" option - click on the "Configure..." button - in the "Action" column, make sure that "Deep Scan" is not set for any of the file types. The Archive Scanning feature utilizes components from Kaspersky Labs. Note: The Archive Scanning feature is disabled by default. 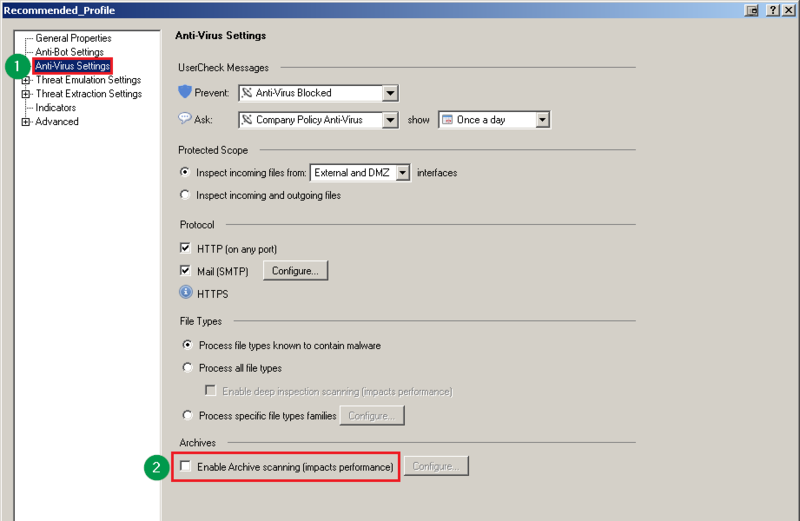 In the Archives section, clear the box "Enable Archive Scanning (impact performance)". The Traditional Anti-Virus feature utilizes components from Kaspersky Labs. Either disable the Proactive Mode. 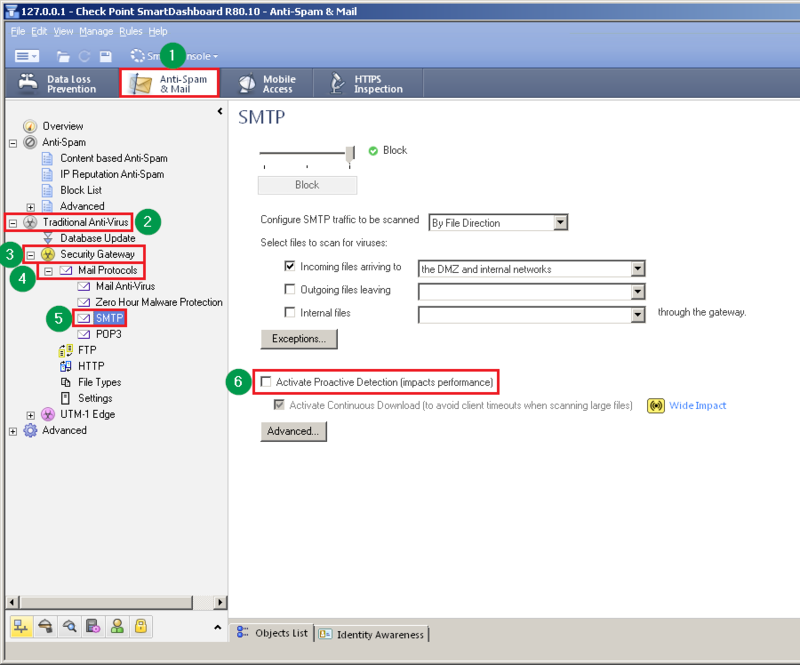 In SmartConsole Navigation Toolbar, click on the MANAGE & SETTINGS. In the upper left section, click on the Blades. In the middle section, scroll to the bottom. 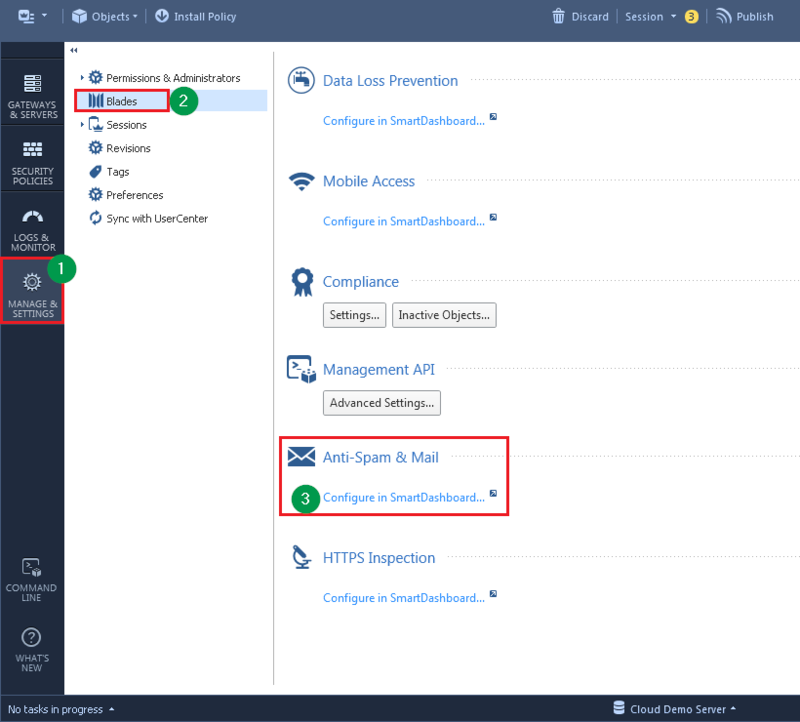 In the Anti-Spam & Mail section, click on the Configure in SmartDashboard... link. In the Legacy SmartDashboard, go to the Anti-Spam & Mail tab. In the left tree, expand on the Traditional Anti-Virus. 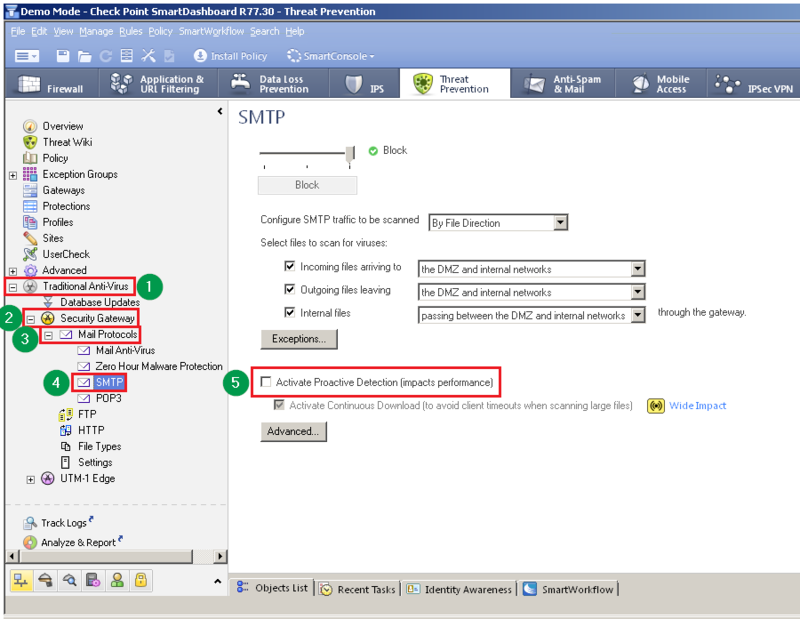 Click on the SMTP page - clear the box "Activate Proactive Detection (impacts performance)"
Click on the POP3 page - clear the box "Scan POP3 traffic with Anti-Virus engine..."
Click on the HTTP page - clear the box "Activate Proactive Detection (impacts performance)"
Go to the File menu - click on the Update. 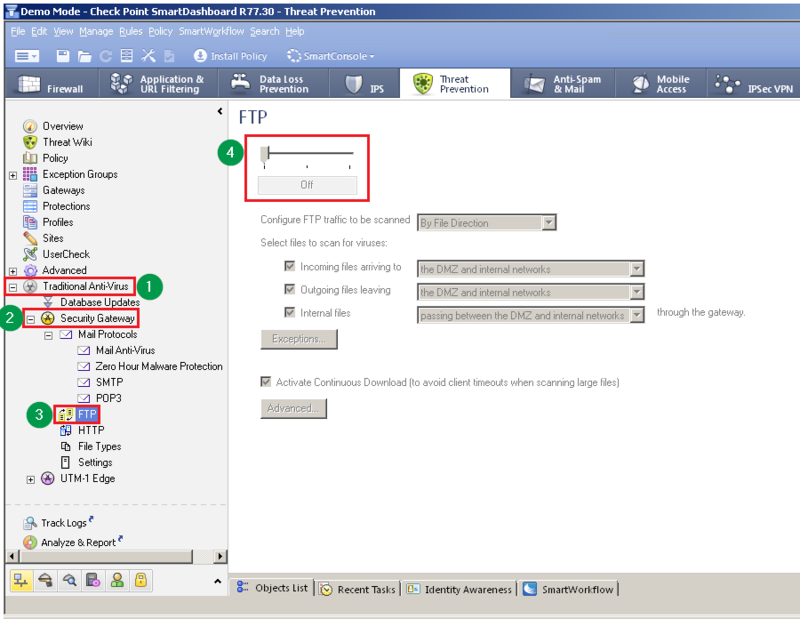 In SmartConsole, install the Threat Prevention policy on this Security Gateway / Cluster. Or use the Anti-Virus blade instead of the Traditional Anti-Virus. Note: The Anti-Virus blade has different supported features than the Traditional Anti-Virus (refer to the Threat Prevention Administration Guide (R80, R80.10 / R80.10)). Note: The Anti-Virus blade has different supported features than the Traditional Anti-Virus (refer to the R77.x Threat Prevention Administration Guide). CPUSE packages were replaced with fix for Endpoint Management server files deletion. Added section "For R80.10 with Jumbo Hotfix Accumulator and above (Remove only)"
"For versions R77.30 and above (Disable & Remove)" section - added CPUSE package that automatically runs the special shell script to remove the Kaspersky Labs components. "For versions R77.30 and above (Disable & Remove)" section - added a note that running the special shell script to remove the Kaspersky Labs components does not require a reboot or restart of Check Point services. 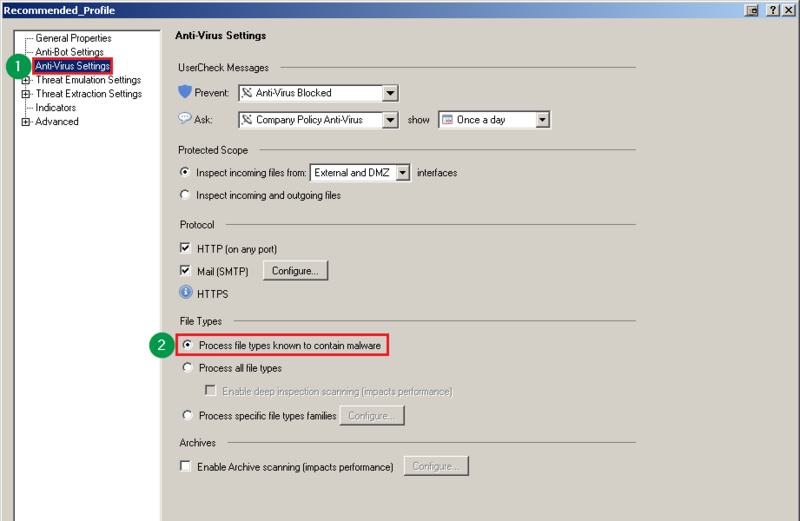 changed from "Anti-Virus Deep Scan and Archive Scanning features are not supported yet in VSX mode" to "Anti-Virus Deep Scan and Archive Scanning features on VSX requires additional engine, which can be requested from Check Point Support"
"For versions R77.30 and above (Disable & Remove)" section - replaced the current shell script with improved shell script that can be executed on a Security Management Server with enabled Endpoint Management. Added section for "R76SP.X on 60000 / 40000 Security Systems"
Added section for "600 / 700 / 1100 / 1200R / 1400 Appliances"